Oklahoma City is a simple, yet charming town that has the benefit of being a big city filled with kind citizens. Known for its cowboy culture and incredible history of triumph as well as tragedy, the metropolis is a beacon of the Midwest that offers countless amazing experiences. When talking about the things you can do inside this well-constructed airport, the list goes on and on. From enjoying free Wi-Fi and carrying out all your internet-oriented tasks, you have the ability to enjoy free breakfast; which include some of the most refreshing meals you have ever tasted. Moreover, you can sit back and enjoy a drink in a centrally air-conditioned bar, or if you missed legs day by any chance – hit the fitness center or the outdoor pool while you’re at it. Apart from what you can cherish inside Will Rogers Airport, you have the opportunity to visit the Museum of Osteology, which is a few miles away from the airport. If you’re looking for fun and games, make your way to Bricktown and spend the time of your life. So, if you have a flight to catch but you still have a few hours of life in Oklahoma, make sure to enjoy the amenities Will Rogers Airport has to offer. The Oklahoma City Airport, most commonly known as the Will Rogers World Airport is one of the most serene airports amidst all the other international state airports all over the U.S. Grabbing the attention of each person who lands on this airport, as well as everyone who departs from here, the Will Rogers Airport provides people with a collection of amenities, both from within and outside. Being one of the most peaceful and clean airports of the Oklahoma state, the Will Rogers Airport is a few miles away from some of the most attractive visiting spots – not only for the residents, but also from the tourists. Will Rogers World Airport only accept flights from cities within the United States, making it a facility that’s comfortable, small, and not too crowded. In addition to it being six miles from downtown, the airport is designed to allow traffic to breathe, meaning you’ll get to your hotel in no time, especially if you reserve a shared ride van with us. Be sure to contact the transportation service for information on pick-up and drop-off locations, not to mention potential deals for future savings. For big groups looking to do big things, you’re going to need a big vehicle. Book a private van from local providers for a wide variety of vehicles, each one giving you the opportunity to see great OKC landmarks like the Myriad Botanical Gardens, home to its own splash park and complimentary classes. If you’re more inclined to hang out at the splash park, then you’ll probably love White Water Baby, a massive water park with dozens of rides, slides, and pools. If you’re going to Oklahoma’s capital for a romantic getaway, reserve a car built for two by booking a private sedan from area service companies, a well-trusted name in local transportation. Visit the Boathouse District for an evening stroll through the iconic row of boathouses and attractions, not to mention the massive zip-line overhead by arriving in unmatched comfort and privacy. Wake up early and spend the next morning at Lake Hefner, a historic man-made lake that’s home to great sunsets and an amazing lighthouse. 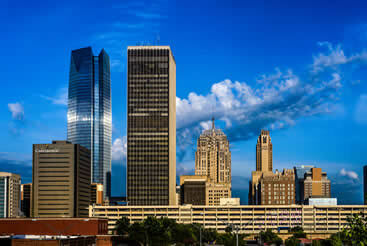 Luckily for families looking for a great time, Oklahoma City is a fantastic way to spend a fun vacation. Whether you’re looking for adventure or want to spend a day learning about local culture, there’s more than enough in the big OKC. Reserve a private SUV from local transportation providers and head to Frontier City, Oklahoma City’s premiere amusement park that hosts tons of western-themed rides. Afterward, get a lesson in history by visiting the National Cowboys & Western Heritage Museum for a look into the wild, wild west. There are all kinds of restaurants in Oklahoma City, but few are as spectacular and homegrown as Red PrimeSteak, a modern upscale eatery located in a beautiful, century-old building. Arrive in style by booking a stretched limo with each ride coming fully equipped with your own driver and yards upon yards of leather seating. After dinner, head to The Wsky Lounge for a glass of fine whisky and a full cigar lounge filled with interesting people and even better stories. For massive groups, reserve a chartered bus – or maybe two. Get one today and have your driver take you to grandiose locations like the Museum of Osteology, which houses over 300 different skeletons alongside educational displays. If the group is urging to get out into the sunlight, take the chartered bus to the Oklahoma City Zoo and Botanical Garden, an astounding animal park that hosts daily shows and attractions. 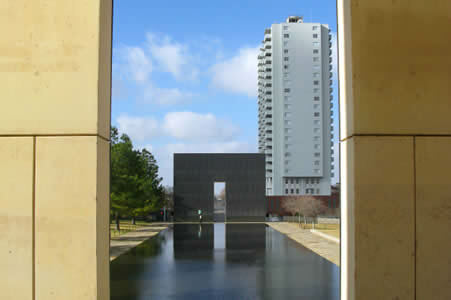 If you’re interested in the tragedy of the Oklahoma City bombing, the best place to visit is the Oklahoma City National Memorial & Museum. The facility is a great place to not only get information about the tragedies that occurred but also pay respects to the victims. 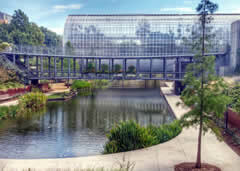 Myriad Botanical Gardens is one of the biggest indoor gardens in the country, making for an amazing downtown experience. There are several tiers of landscaped areas as well the primary feature, the Crystal Bridge Tropical Conservatory, which is essentially a living and breathing museum on plants, flowers, exotic animals, and waterfalls. Lake Hefner is a reservoir just outside of Oklahoma City, but is a great place to relax and get a feel for the state’s true countryside. 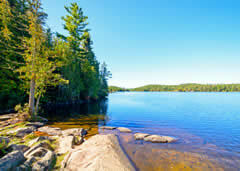 Built in the mid 20th century, the park is landscaped for beauty and maintained for a variety of recreational activities, including fishing, hiking, and biking. Will Rogers Airport is a modern and easily run airport located roughly 6 miles southwest of downtown. Although there isn’t anything particularly incredible about the facility, it’s the only airport in the world to use ‘world’ in its name. Airport Express Oklahoma City is one of the best ride services, offering airport transportation through several shuttles at varying rates. If you’re in need of 24-hour assistance, Oklahoma Shuttle Lightning Express is another great transportation service that offers full-time shuttles at lightning speed. SpringHill Suites Oklahoma City is a 3-star hotel that also happens to be incredibly affordable. Each room contains a homey living room and free Wi-Fi. If you’re looking for a pampered night as opposed to something inexpensive and comfortable, dive into 4-star sheets at The Skirvin Hilton, a historic resort with an indoor pool and easy access to downtown. One of the most popular burger joints in the city is Nic’s Grill, a busy and inexpensive restaurant that never disappoints, making it a great place for the whole family to visit. If you’re looking for some upscale eats, take a visit to Red PrimeSteak for some real American beef. If you end up bored and sitting in your hotel room, wondering what to do with your time, see what else Oklahoma City has to offer by visiting the many public museums like the National Cowboy & Western Heritage Museum, which offers a great background into Oklahoma’s real history of cowboys! Another great educational facility is the Museum of Osteology, a museum with surprisingly interesting exhibits and bad to the bone dinosaurs.